In 2000, the UN Security Council adopted Resolution 1325, the first in a series of six resolutions on Women, Peace and Security, which not only recognizes the disproportionate impact of armed conflict on women but also stresses the crucial importance of including women in all phases of peace processes to ensure sustainable peace and security. Experience has shown that the challenges to implementing these resolutions remain significant. A great deal remains to be done in the areas of gender justice, reflecting on masculinities, peace-building, conflict transformation and the promotion of human rights. This course provides a forum for learning and exchange. It will offer insights to the Women, Peace and Security agenda and a unique opportunity to network with professionals from different regions, countries and contexts. Confirmed faculty includes Prof. Cees Flinterman (member UN Human Rights Committee/former CEDAW member), Prof. Rikki Holtmaat (Leiden University), Prof. William Schabas (Leiden University) and Prof. Dubravka Zarkov (International Institute for Social Studies). 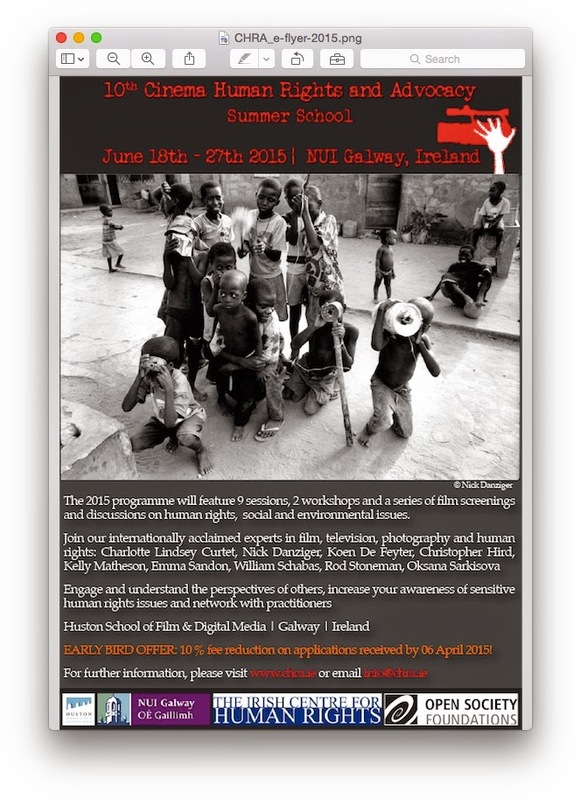 Professionals and advanced students with a clear interest in the theme are invited to apply. This summer school offers a unique opportunity to gain expertise in international criminal law in the International City of Peace and Justice in just two weeks time. The course, which welcomes around 50 participants from all over the world, combines theory with practice: academics from Leiden University and experts from the international courts and tribunals lecture on topics as genocide, crimes against humanity, the crime of aggression, war crimes and modes of liability, while students develop their skills through an inter-active cross-examination session with senior trial lawyers from the Office of the Prosecutor of the International Criminal Court and a challenging moot court exercise. Confirmed faculty includes Prof. Niels Blokker, (Leiden University), Prof. William Schabas (Leiden University), Dr. Philipp Ambach (ICC), Dr. Mohamed M. El Zeidy (ICC), Hirad Abtahi (ICC), Gilbert Bitti (ICC), Alexis Demirdjian (ICTY), Geoff Roberts (STL), Coleen Rohan (International Criminal Law Bureau) and Niamh Hayes (Institute for International Criminal Investigations). Young professionals and (law) students with a clear interest in the topic are invited to apply. Frontiers of Children’s Rights takes a close look at contemporary children's rights issues from a legal perspective, accompanied by reflections from other academic disciplines, legal systems, local perceptions and realities. Leading academic and professional experts in the field of children's rights, international law and other relevant disciplines offer inspiring and interactive lectures, seminars and excursions in and around the historical university town of Leiden. The sessions will focus on children’s rights and juvenile justice, children’s rights and alternative care, children’s rights and global issues, children’s rights and international criminal law, children’s rights and the virtual world and monitoring children’s rights. Confirmed faculty includes Prof. Ton Liefaard (UNICEF Chair in Children’s Rights at Leiden University), Prof. Julia Sloth-Nielsen (Professor of Children’s Rights in the Developing World at Leiden University), Prof. Jaap Doek (Former Chair UN Committee on the Rights of the Child), Prof. Ursula Kilkelly (University College Cork), Ms. Tulika Bansal (Danish Institute for Human Rights) and Dr. Christian Salazar (UNICEF). Business has enormous power to improve children’s lives through the way in which they operate facilities, develop and market products, provide services, and exert influence on economic and social development. Conversely, business has the power to disregard or even imperil the interests of children. This course, offered in close cooperation with UNICEF, provides a comprehensive overview of the framework that has been developed to guide business’ interactions with children, including the standards and tools that are available to companies and governments. The sessions will cover The UN Guiding Principles on Business and Human Rights as a framework for a focus on children, Children’s Rights and Business Principles, company management processes and practices for advancing children’s rights, the governmental responsibility to protect children’s rights in the context of business activities, the role of civil society and international organizations in promoting and protecting children’s rights in the context of business activities and child rights in the context of the travel and tourism as well as the extractives industries. Company representatives, staff of international organizations, government employees and graduate students with a demonstrated interest in this topic are invited to apply. The relationship between human rights, transitional justice and development requires fresh attention. The field of transitional justice has evolved in the past decade to include social, economic, cultural and legal dimensions, and to cover larger objectives such as rule of law and development. While a more holistic view on transitions might be welcome, the different fields may conflict with each other. Justice actors are not development agents, nor are development actors necessarily best agents for accountability, truth or reparations. Making development assistance contingent on rule of law reform may be counterproductive, since it may create dependencies or discrepancies in relation to needs of protection or other more pressing socio-economic needs (health, education, access to resources etc.). Conversely, promoting justice through instruments of development may have significant downsides. As evidenced in the transitional justice context, awarding reparation through development programmes may leave victims with a feeling that their suffering is not sufficiently recognized. More work is required to identify how the mutual synergies between these fields may be used most effectively to the benefit of all of them. This is the central inquiry of this Summer School. It explores linkages, as well as tensions between justice processes, reparations and development. Confirmed faculty includes Djordje Djordjevic (UNDP), Roger Duthie (ICTJ), Paul Seils (ICTJ), Prof. William Schabas (Leiden University) and Marieke Wierda (Transitional Justice Advisor UNSMIL). Professionals and advanced students with a background in law or human rights are invited to apply. During this intensive course, run by two highly experienced international criminal defence lawyers, participants will be engaged in role play and practical exercises and improve their advocacy and litigation skills. The training will focus on the skills of case theory, opening statements, direct examination (examination-in-chief), cross-examination (previous inconsistent statements), re-examination, closing statements and legal submissions skills. The course will be concluded with a mock trial at the end of the week, in which participants can apply their acquired knowledge and skills. Apart from the theory and the practical exercises, the course includes visits to the International Criminal Court and the Special Tribunal for Lebanon. A special guest lecture will be given by a leading Defence Counsel at the Special Tribunal for Lebanon. Professionals as well as graduate law students who wish to develop and improve their advocacy skills are invited to register. 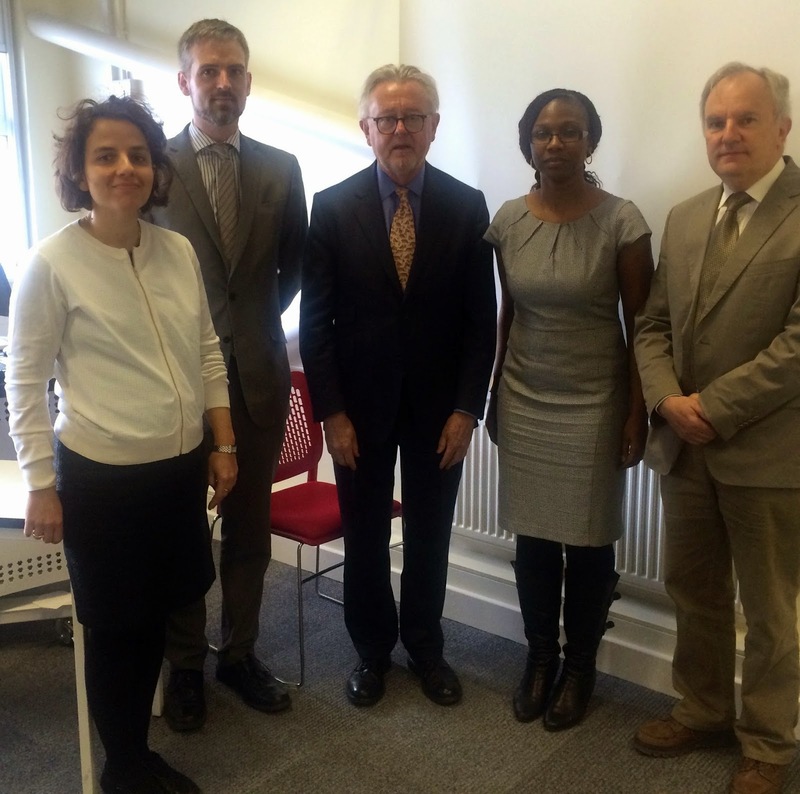 From left: Irini Katsirea (chair), Anthony Cullen, myself, Izevbuwa Kehinde and Ray Murphy. 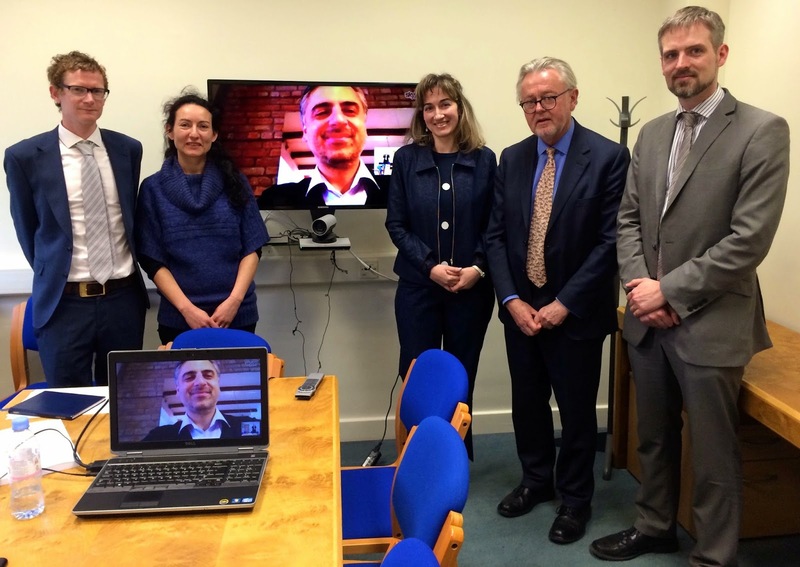 From left: David Keane (chair), Elvira Dominguez, Payam Akhavan (on screen), Tatiana Batchvarova, myself and Anthony Cullen. Two Middlesex students successfully defended their doctoral theses today. Both were in the area of international criminal law. This morning, Izevbuwa Kehinde presented her thesis on the impact of international criminal courts and tribunals in the Commonwealth. Prof. Ray Murphy of the National University of Ireland Galway was the external examiner and Dr Anthony Cullen was the internal examiner. The supervisors were myself and Dr Nadia Bernaz. In the afternoon, Tatiana Batchvarova defended her thesis on the standing of victims in the procedural design of the International Criminal Court. Prof. Payam Akhavan of McGill University was the external examiner and Dr Elvira Dominguez was the international examiner. The supervisors were myself and Dr Anthony Cullen. Congratulations to Izevbuwa and Tatiana.